For everyone that wants the Doctor Who Pocket POP!s, you can get them at Hot Topic now. I agree it would be amazing to see Sucker punch especially those villain, oh I would love it! The girls of Sucker Punch are desperately needed in the POP line-up. It’s hard to believe Funko gave us figures from Jupiter Ascending, but none of characters that are crying out to be seen in this form. Hopefully you saw this has been made real. I agree the Bioshock POP’s are going to be so awesome I cannot wait till those are released! Still nothing about Quicksilver? Guys, come on! I wish there were Funko POP Vinyls of Nintendo characters. Did you manage to get the Golden Frieza? What about Steven Universe? That would be awesome. Would love Clue the Movie, The Addams Family, I Love Lucy, Get Smart, and classic SNL! Any The Walking Dead coming out? I would buy them all! And they could have their weapon as an accessory! Great suggestion! It’s their 30th anniversary in December. Perfect timing! They should do Dawson’s Creek, and do a variant crying Dawson figure just like the picture in the ad on this page. Please do ‘Goosebumps’ POP figures for the new movie coming out!!! I will love to see the new SCREAM TV series Ghosthead pop figure! Grimm has been renewed for SEASON 5! 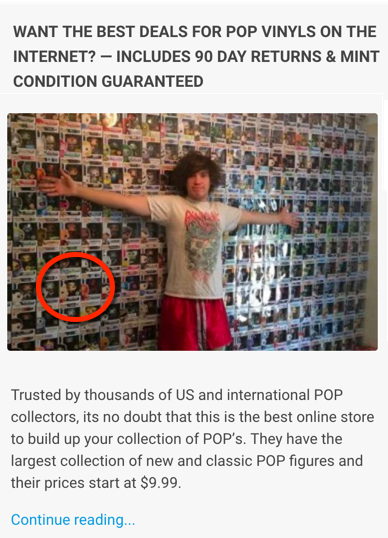 It’s high-time the fans have Funko! Fans are making them on their own! There’s tons of variety with all the Wesen, and of course there’s the human form/Wesen form option. (Two figures for one character = more money for you guys!) And let’s not forget the opportunities for additional Wesen when new seasons come out! I, for one, want a Monroe figure! He’d be adorable in a plaid shirt or a comfy cardigan sweater. Maybe he could have a pocket watch accessory or a glass of red wine. If you’re a Grimm fan, spread the word on Twitter with hashtag #WeNeedGrimmFunko! Let @FunkoPOPvinyl know this needs to happen! Grimm Fan Since The Pilot! I couldn’t agree more with this! League of Legends! KINGDOM HEARTS! FINAL FANTASY! Do you know if they are going to make any more Walking Dead pop vinyls? TEEN WOLF!! (the TV show) So many people want teen wolf ones, pleaaaaase. And ‘The 100’ would be awesome aswell. Will Pop! Music figures ever be created? Lady Gaga wood be awesome! The Meat Dress! Not sure if this has been mentioned or not but Fraggle Rock would make amazing pops ! Would love more Sons of Anarchy: Chibs, Tig, Bobby, Juice, Happy, Unser. More Harry Potter: Neville, Luna, The Weasley Twins, Sirius Black, Remus, Mad eye Moody. Bobby from Supernatural, More Game of Thrones please: Varys, Mellisandre, Catlynn Stark, Bran Stark, Theon Greyjoy. Space balls would be fun too, Gilmore Girls: Lorelai, Rory, Luke, Dean, Jess, Sookie, Emily and Richard Gilmore. I would love to see Labyrinth pops, Jareth, Ludo, Sarah, Hoggle they would just be amazing! Red Arrow, Kid-Flash, Quicksilver, Classic Hawkeye, Scarlet Witch and Quicksilver, Farscape, Stargate, Clerks, Daredevil, and Heroes. Parks and Recreation! I would be so happy with a Leslie Knope pop! That and the office, and Psych! And Sherlock too! Need a Beth Greene figure! The Last Airbender or Legend of Korra figures would be amazing too! But for now I’m just really excited about Mulan!!! ALL Women Ghostbusters cast !!! Batman The Animated Series would be great! I would love to see a Birds of Prey set, with a good Black Canary, Huntress, and Oracle. An Injustice set would be fun, too. As far as singles, a Jonah Hex, Captain Marvel, and a Killer Frost would be fun. And how about a Brand and an Andi from the Goonies? That would complete my collection. Also, what about Flynn Rider? PLEASE make Twin Peaks Pops! And Parks and Recreation ones as well. My life will be complete. Grimm Funko and Heroes too with the rebirth of the show. For Video Gamers, I would love to see the Dark Souls series as well. Im still waiting for Mortal Kombat! What about the old school nick toons?? Lost Boys, Parks And Recreation, Nightcrawler from X-Men, Farscape, Xena, Hercules, Metallica, Indiana Jones & Bladerunner would all be cool. Would love to see My Name Is Earl, Dazed and Confused, and Gravity Falls! I cannot believe that there isn’t any The Walking Dead pop vinyls coming out. Don’t know if anyone else has suggested this before – Spaceballs, including the Winnebago as a Rides. Amazing world of gumball, plz! is there going to be a doctor who series 2?? I know Fight Club was on the list, is there an e.t.a. ? You know who else belongs on my shelf? Crockett & Tubbs. I wonder what the likelihood of that happening is? COME ON !! Do SUCKERPUNCH !!!! PLEASE!!!!! Metal Gear Solid, Big BOSS, Solid SNAKE Please!!! Would love David Letterman, Draymond Green, Salute Your Shorts, and 90s Nickelodeon, Bill & Ted, American Graffiti, Even Stevens, Holes, Boy Meets World, Pee-Wee Herman, Good Burger, Men in Black, Mystery Men, and more Muppets! Laverne and Shirley, with Lenny and Squiggy and Carmine….Shirley could come with BooBoo Kitty!! I would love to see the Danganronpa: Trigger happy havoc and Danganronpa 2: Goodbye despair!! I’d buy them all in a heart beat! i’d lovw to see Crockett & Tubbs, and I thought they had announced Top Gun but I haven’t heard squat about those. And how bout Cheers? I would love to see more Aladdin characters (Aladdin, Abu, and Rajah specifically). Oh and the caterpillar from Alice in Wonderland would be awesome. As well as more chracters from A Bug’s Life (Francis, Tuck, Roll, Gypsy, Slim, Dim, Manny, The Queen, and Rosie). Anastasia characters would be cool!